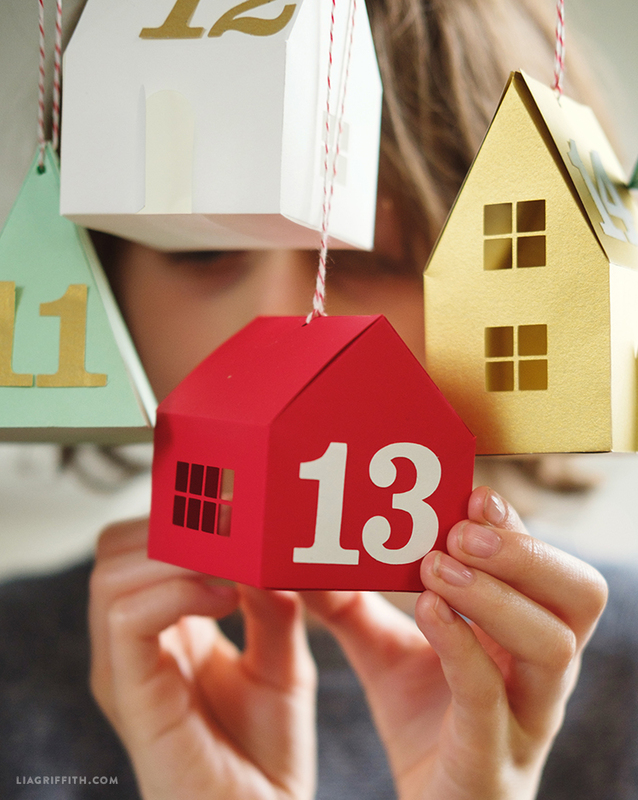 Advent calendars are an age-old Christmas tradition that are fun for all ages. Ever year, we create a design or two to put a fresh and fun spin on this classic concept. 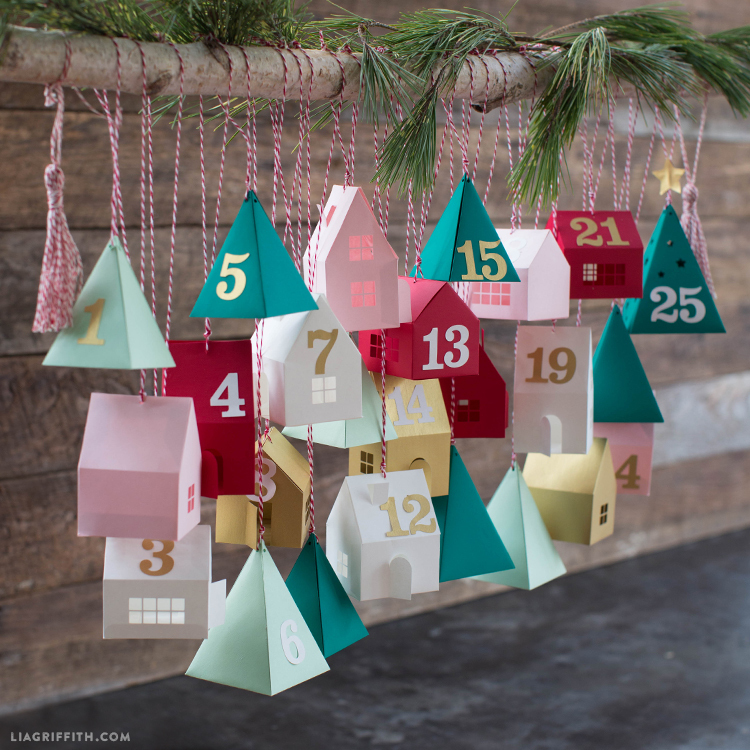 This year, designer Krista came up with this cute-as-can-be hanging DIY advent calendar village. 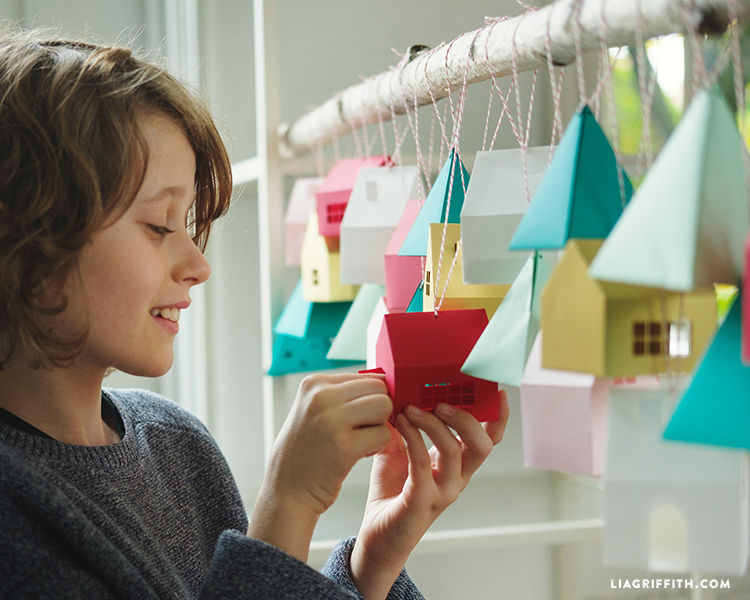 After you’ve assembled this design, fill each box with surprises to be unveiled every day of December. 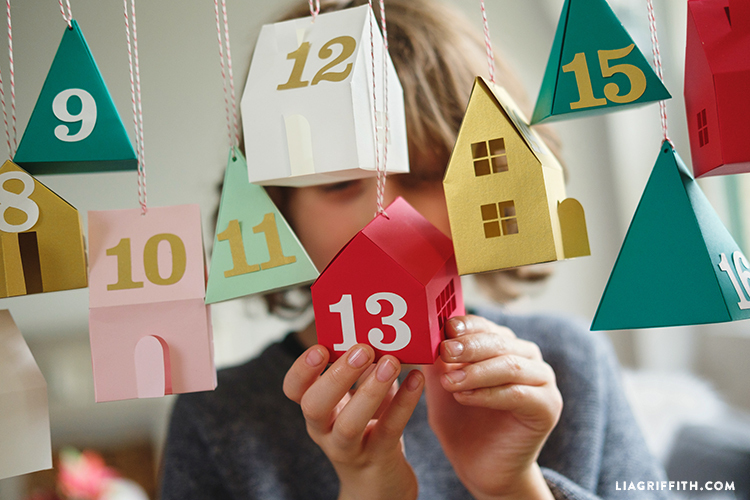 A fun alternative is to leave the twenty-fifth box open for Santa to fill the night of the twenty-fourth — your little ones will love it! 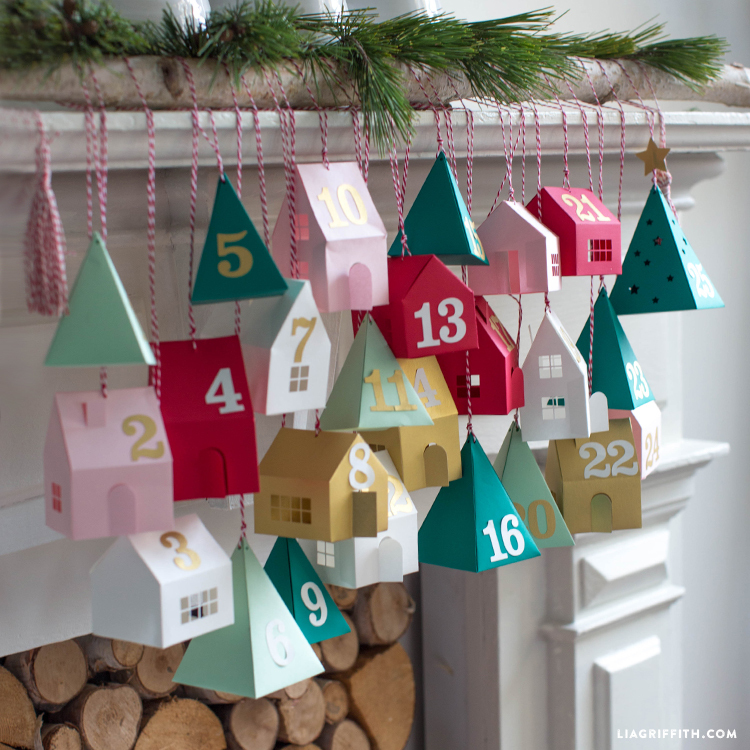 To assemble your advent calendar, simply download either our SVG or PDF files. 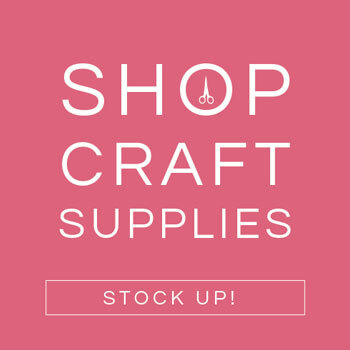 (Use SVG if cutting with a cutting machine or PDF if cutting by hand.) 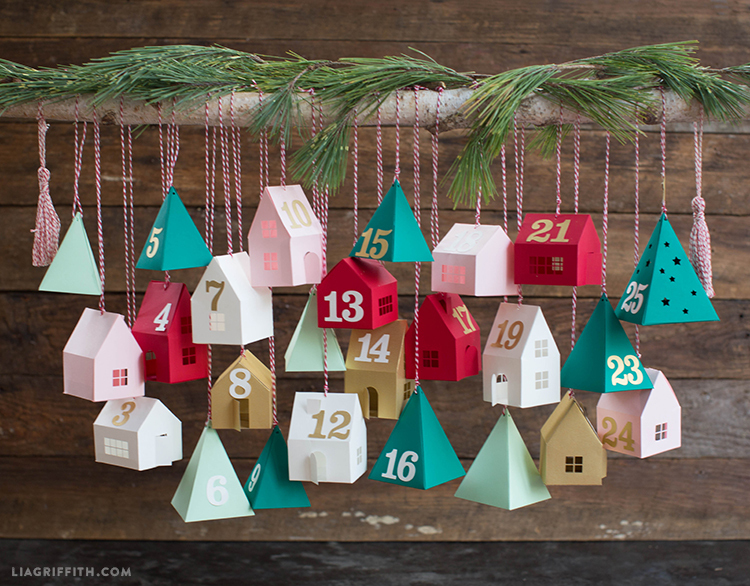 Krista used text weight versions of all of the papers listed, but she recommends cover weight if you want your advent calendar to last for seasons to come. Cut out your calendar according to the template. If cutting with a scissors, you will probably want to use an X-Acto blade to cut out the finer details such as the stars and windows. 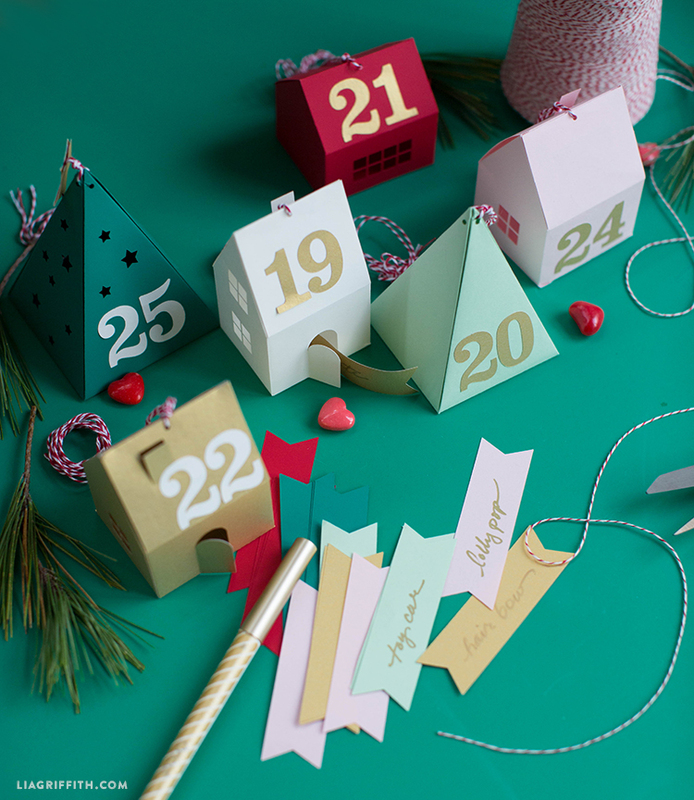 Using a glue dot roller or a glue stick, glue your calendar pieces together. 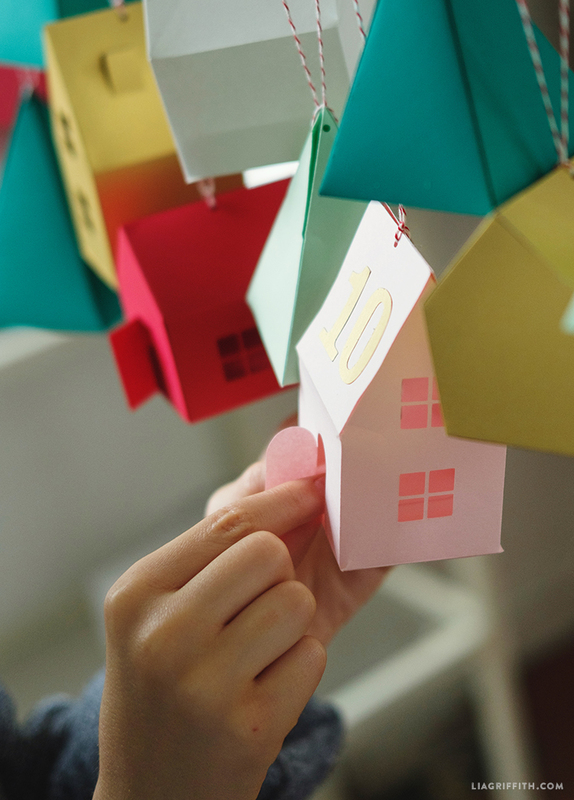 Attach each paper house to baker’s twine and hang along a stick, as ornaments on a Christmas tree, or anywhere else of your choosing. I am having a problem with score lines for the cricut. I tried to attach but to no avail. I don’t know how to set it to score. Its been 8 months and the files are not fix yet. The second house is just lines. Michelle, can you please send a screenshot to hello@liagriffith.com? We aren’t having any issues with the file, and would like to see what you’re seeing. 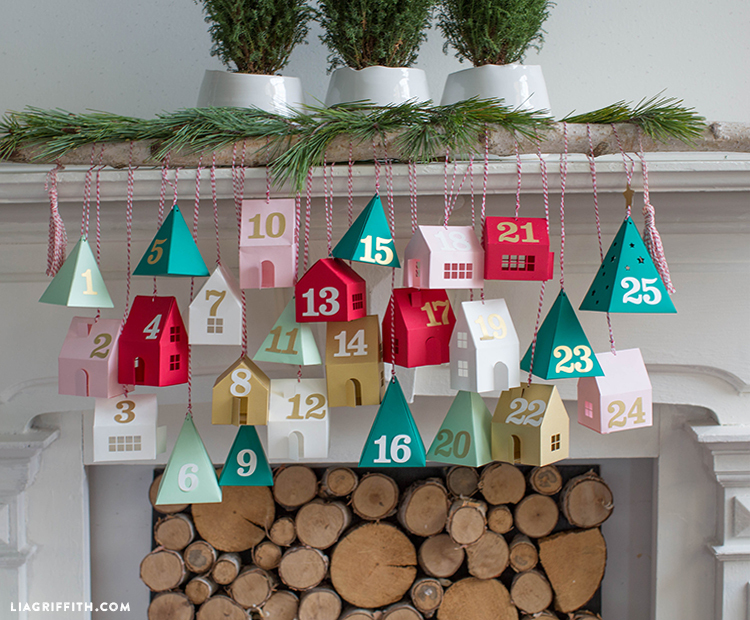 Good evening, I have tried to do this Advent Calendar, but there seems to be something wrong with the SVG file, because the houses are tiny. The numbers are way bigger than the houses. They come out perfect, but as I said they are tiny. Hi Jackeline, we double-checked our files and everything looks fine on our end. The preview of the files does make it look like the houses are much smaller than numbers, but once you go into the project, it’s all correct. I am having problem understanding the cut file. There are 3 houses here but 2 of them seem like they are not “done” ie no windows, no place to glue. When I ungroup i am not able to group what i have selected. I hope this makes sense. This is my first 3d try with this site. Hi! I sent you an email with screenshots of what you should be seeing. 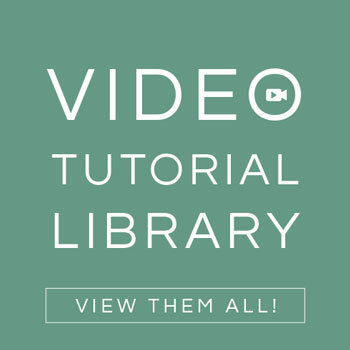 The problem is most likely just what you are viewing in Design Space. 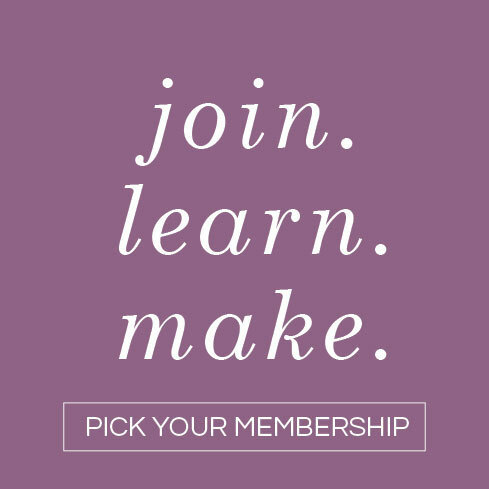 For some reason, some lines and objects look different in Design Space but still cut fine (we are working with Cricut to understand why/how to fix this). After you upload the SVG file, ungroup everything, then set the black line layers to “Score”, then “Attach” to the right houses. It will display correctly (the black lines change to dashed). I know it looks weird when you first load it in but after you do those steps it should look fine.